Energy is added to the gas stream in the combustor, where fuel is mixed with air and ignited. In the high pressure environment of the combustor, combustion of the fuel increases the temperature. 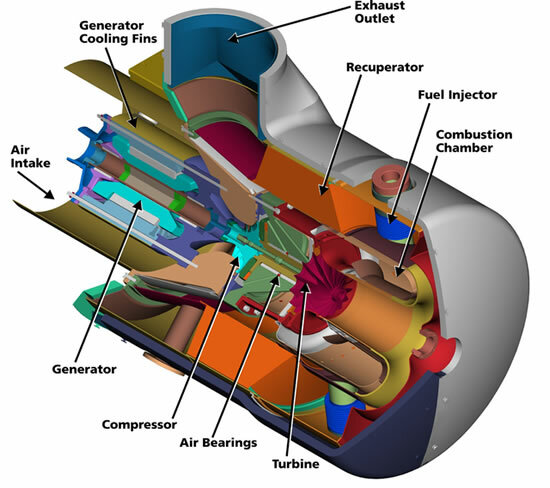 The products of the combustion are forced into the turbine section. There, the high velocity and volume of the gas flow is directed through a nozzle over the turbine’s blades, spinning the turbine which powers the compressor and, for some turbines, drives their mechanical output. 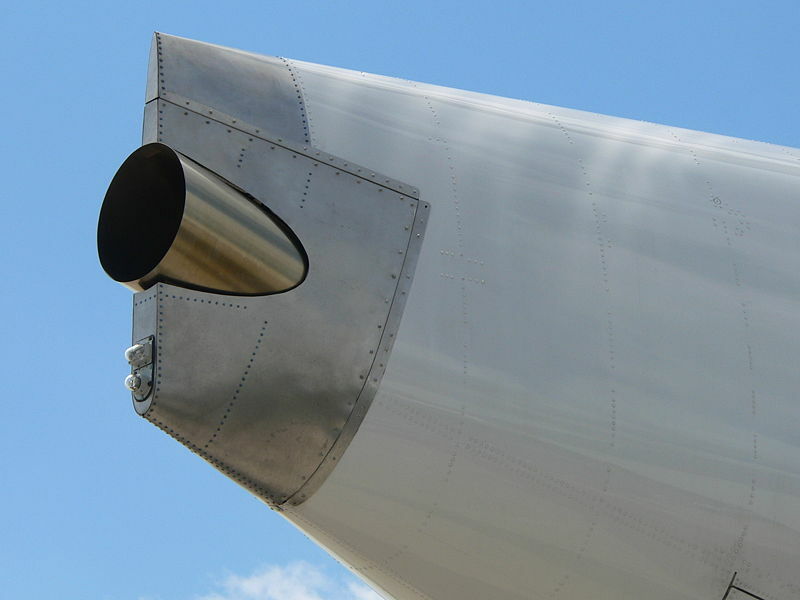 The energy given up to the turbine comes from the reduction in the temperature and pressure of the exhaust gas. 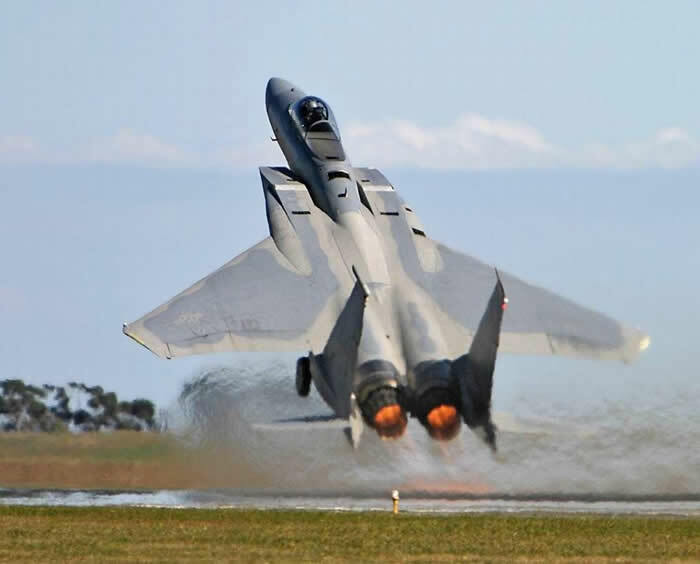 Energy can be extracted in the form of shaft power, compressed air or thrust or any combination of these and used to power aircraft, trains, ships, generators, or even tanks. 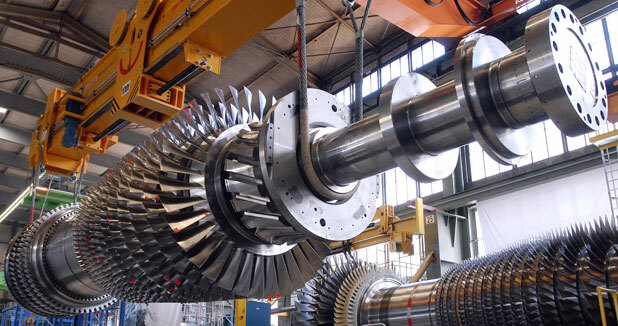 ncreasing numbers of gas turbines are being used or even constructed by amateurs. More sophisticated turbojets are also built, where their thrust and light weight are sufficient to power large model aircraft.The Schreckling design constructs the entire engine from raw materials, including the fabrication of a centrifugal compressor wheel from plywood, epoxy and wrapped carbon fibre strands. Industrial gas turbines differ from aeroderivative in that the frames, bearings, and blading are of heavier construction. Industrial gas turbines range in size from truck-mounted mobile plants to enormous, complex systems.They can be particularly efficient—up to 60%—when waste heat from the gas turbine is recovered by a heat recovery steam generator to power a conventional steam turbine in a combined cycle configuration.They can also be run in a cogeneration configuration: the exhaust is used for space or water heating, or drives an absorption chiller for cooling or refrigeration. Such engines require a dedicated enclosure, both to protect the engine from the elements and the operators from the noise. The construction process for gas turbines can take as little as several weeks to a few months, compared to years for base load power plants. Their other main advantage is the ability to be turned on and off within minutes, supplying power during peak demand. Since single cycle (gas turbine only) power plants are less efficient than combined cycle plants, they are usually used as peaking power plants, which operate anywhere from several hours per day to a few dozen hours per year, depending on the electricity demand and the generating capacity of the region. In areas with a shortage of base load and load following power plant capacity or low fuel costs, a gas turbine power plant may regularly operate during most hours of the day. A large single cycle gas turbine typically produces 100 to 400 megawatts of power and have 35–40% thermal efficiency. 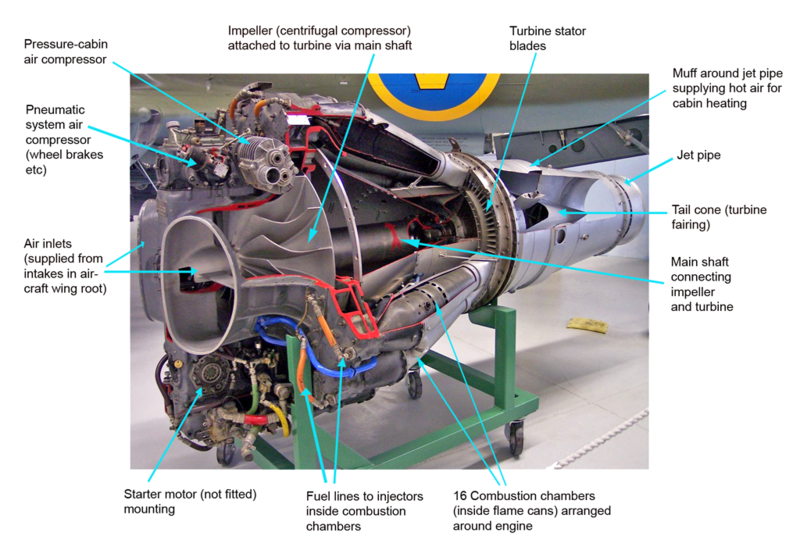 Turboshaft engines are often used to drive compression trains (for example in gas pumping stations or natural gas liquefaction plants) and are used to power almost all modern helicopters. The first shaft bears the compressor and the high speed turbine (often referred to as “Gas Generator” or “Ng”), while the second shaft bears the low speed turbine (or “Power Turbine” or “Nf” – the ‘f’ stands for ‘free wheeling turbine’ on helicopters specifically due to the fact that the gas generator turbine spins separately from the power turbine). This arrangement is used to increase speed and power output flexibility. n 1963, Jan Mowill initiated the development at Kongsberg Våpenfabrikk in Norway. Various successors have made good progress in the refinement of this mechanism. Owing to a configuration that keeps heat away from certain bearings the durability of the machine is improved while the radial turbine is well matched in speed requirement. With this in mind the pioneer of modern Micro-Jets, Kurt Schreckling, produced one of the world’s first Micro-Turbines, the FD3/67.This engine can produce up to 22 newtons of thrust, and can be built by most mechanically minded people with basic engineering tools, such as a metal lathe. Microturbines are becoming widespread for distributed power and combined heat and power applications. They are one of the most promising technologies for powering hybrid electric vehicles. They range from hand held units producing less than a kilowatt, to commercial sized systems that produce tens or hundreds of kilowatts. Basic principles of microturbine are based on micro combustion. Microturbine systems have many advantages over reciprocating engine generators, such as higher power-to-weight ratio, low emissions and few, or just one, moving part. Advantages are that microturbines may be designed with foil bearings and air-cooling operating without lubricating oil, coolants or other hazardous materials. Microturbines also have a further advantage of having the majority of the waste heat contained in the relatively high temperature exhaust making it simpler to capture, whereas the waste heat of reciprocating engines is split between its exhaust and cooling system. When used in extended range electric vehicles the static efficiency drawback is irrelevant, since the gas turbine can be run at or near maximum power, driving an alternator to produce electricity either for the wheel motors, or for the batteries, as appropriate to speed and battery state. The batteries act as a “buffer” (energy storage) in delivering the required amount of power to the wheel motors, rendering throttle response of the GT completely irrelevant. There is, moreover, no need for a significant or variable-speed gearbox; turning an alternator at comparatively high speeds allows for a smaller and lighter alternator than would otherwise be the case. The superior power-to-weight ratio of the gas turbine and its fixed speed gearbox, allows for a much lighter prime mover than those in such hybrids as the Toyota Prius (which utilised a 1.8 litre petrol engine) or the Chevrolet Volt (which utilises a 1.4 litre petrol engine). This in turn allows a heavier weight of batteries to be carried. The weight can be made up of more batteries, which allows for a longer electric-only range. Alternatively, the vehicle can use heavier types of batteries such as lead acid batteries (which are cheaper to buy) or safer types of batteries such as Lithium-Iron-Phosphate. When gas turbines are used in extended-range electric vehicles, like those planned by Land-Rover/Range-Rover in conjunction with Bladon, or by Jaguar also in partnership with Bladon, the very poor throttling response (their high moment of rotational inertia) does not matter, because the gas turbine, which may be spinning at 100,000 rpm, is not directly, mechanically connected to the wheels. It was this poor throttling response that so bedevilled the 1960 Rover gas turbine-powered prototype motor car, which did not have the advantage of an intermediate electric drive train. Gas turbines accept most commercial fuels, such as petrol, natural gas, propane, diesel, and kerosene as well as renewable fuels such as E85, biodiesel and biogas. However, when running on kerosene or diesel, they will typically be unable to start without the assistance of a more volatile product, such as propane gas. MIT started its millimeter size turbine engine project in the middle of the 1990s when Professor of Aeronautics and Astronautics Alan H. Epstein considered the possibility of creating a personal turbine which will be able to meet all the demands of a modern person’s electrical needs, just as a large turbine can meet the electricity demands of a small city. Problems have occurred with heat dissipation and high-speed bearing in these new microturbines. Moreover, their expected efficiency is a very low 5-6%. According to Professor Epstein, current commercial Li-ion rechargeable batteries deliver about 120-150 W·h/kg. MIT’s millimeter size turbine will deliver 500-700 W·h/kg in the near term, rising to 1200-1500 W∙h/kg in the longer term.